How do I join the Episcopal church if I have never been confirmed in the Episcopal Church? Since the 1978 Prayerbook and the liturgical renewal that preceded it, the church has recognized the primacy of Baptism. Baptism is all that is required to be a full member of the Body of Christ, and to receive the Eucharist. You can join the Episcopal Church as a Baptized member if you have ever been baptized with water “in the name of the Father, and of the Son, and of the Holy Spirit“. Please contact Mother Susan+ or call the church office 813-988-6483. 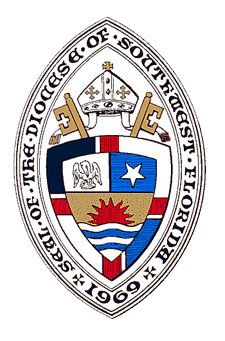 How do I join this parish if I have been a member of another Episcopal parish? You should notify your previous parish that you wish a “letter of transfer” from them. This applies only to Episcopal parishes. If you need assistance with this, please contact our church office: 813- 988-6483. One is Baptism, a sacrament performed by a Priest, or a Deacon. When you are baptized in an Episcopal Church you become part of the Body of Christ and a baptized member of that parish. Another way to join is through Confirmation, a sacrament that is an “adult” statement of faith, a renewal of your baptismal covenant. Only a Bishop can lay hands on someone for confirmation in our tradition. 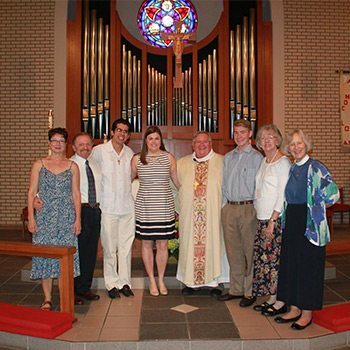 When you are confirmed at St. Catherine of Alexandria Episcopal Church, you become a Confirmed member of the parish. Our Bishop Dabney, or one of our retired assisting Bishops, visits us about every 18 months. When we know the Bishop’s visitation date, I will announce a confirmation class. This class is required for adult confirmation. Youth confirmation is offered as part of our Journey to Adulthood program, during the two years of the J2A program, to youth who regularly attend church and J2A. Confirmation is required for many leadership positions, including Vestry members, those who assist in worship as Lay Readers and Chalice Bearers, and Lay Eucharistic Visitors ( those who take consecrated bread and wine to those unable to attend worship because of illness or infirmity ). What if I was confirmed in another denomination? If someone comes to the Episcopal church from the Roman Catholic Church or the Lutheran Church and has been confirmed in one of these traditions, they can be “received” into the Episcopal Church by the Bishop (in the same service as confirmation). We recognize their confirmation as valid, having been done by a Bishop in Apostolic Succession, as is done in our tradition. If someone was confirmed in a tradition without Apostolic Succession, we do not recognize that confirmation as a sacrament so they would be confirmed in our tradition, by our Bishop, who is in Apostolic Succession. "And he has put all things under his feet and has made him the head over all things for the church, which is his body, the fullness of him who fills all in all." Submit The Form Below To Join!